Car accidents in the United States, as we know, are very common. The NHTSA reports that the largest single cause is driver error. All of the other “non-driver” causes follow this fact. Distracted Driving: This includes use of cellphones, (calls, texts) talking to others, applying makeup, etc., that takes attention away from the road. Alcohol: A driver decides to drink and then get behind the wheel, which causes more than 40% of traffic deaths. Alcohol lowers reaction times and the ability to focus. Speeding: A driver, going too fast, takes chances, and cannot react in time to avoid dangers. Teenage drivers who speed do not have enough driving experience to be able to quickly handle a sudden event. Hazards on the road; There are many, like potholes or uneven areas, that are hard to see in time to avoid them. 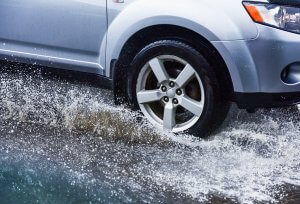 Weather conditions: In Louisiana, especially, sudden rain storms can lead to flooding or slippery patches in the road. Mechanical problems: A car that does not have proper brakes or has worn-out tires can also be the cause of an accident. Deaths in car accidents have actually been lower in 2017, reports the National Safety Council, in an article by CNBC. This should be good news, however, things are not really getting better on our highways. Louisiana is seeing a 23% rise in motor vehicle deaths, according to the NSC. What about careless or distracted driving? LSU Highway Safety Research Group, in 2017, reports that Louisiana is ranked as the worst state. Using smartphones is a major reason. In a Louisiana lawsuit, those drivers are responsible for the injuries and/or wrongful death they cause due to negligence. Pay attention to your driving and the road at all times. Leave the phone alone, as well everything else that is not on driving. Never drink and drive. The same goes for drugs, prescription medicines, etc. Follow the speed limits and all other rules of the road, traffic lights, etc. Do not let another driver make you angry. Also, do not make the other driver angry. If you can do it safely, get away from the vehicle. If you know about hazards on the roads you take, change your route to a safer one. Why not do everything as a driver to prevent a car accident? You and your passengers should understand the causes of car accidents, follow the rules, and do your part to drive safely. You cannot control other drivers, but you can help prevent road accidents. If you have suffered injuries or lost a loved one in a car accident, you can get help. The Louisiana personal injury lawyers at the Law Offices of L. Clayton Burgess know how to handle car accident claims. They offer a free consultation to help advise you. Victims can get compensation for the physical, financial and economic harm that was done to them. Contact us toll- free at 1-877-234-7573.